In this short essay, appeared on Studio magazine #2 (ORIGINAL), among other recommended contributions by friends DPR-Barcelona, Deconcrete, La Periferia Domestica, Nick Axel…, we aimed at tracing an origin for particular architectural spaces in connection to rituals. Here you can find a pdf file. Originated from ancient cults, several architectural types followed through time the evolution or the persistence of the symbolic set of actions known as rituals. Once the practice of the cults faded in time, the corresponding buildings lost or changed their original function and became monuments whose recondite meaning is sometimes just barely decipherable today. Sacral rules or specific needs were translated into buildings which could either serve as mere settings for a ceremony or become fully specific, constitutive elements of the rite as much as a set of prescribed dresses or formal actions and movements. The birth of contemporary rituals provides evolving scenarios for architectures whose shape and language are yet to be invented and the origin of form is connected to the invention or the interpretation of the ritual. In some cases, a ceremony may provide a further, deeper layer of meaning to a building and expand the physical space through the rules of unusual occupations. Looking to contingent scenarios or timeless values, we traced the origin of four architectural spaces in connection to four rituals. Whether newly invented or reshaped from existing practises, they materialise into powerful statements of human values. 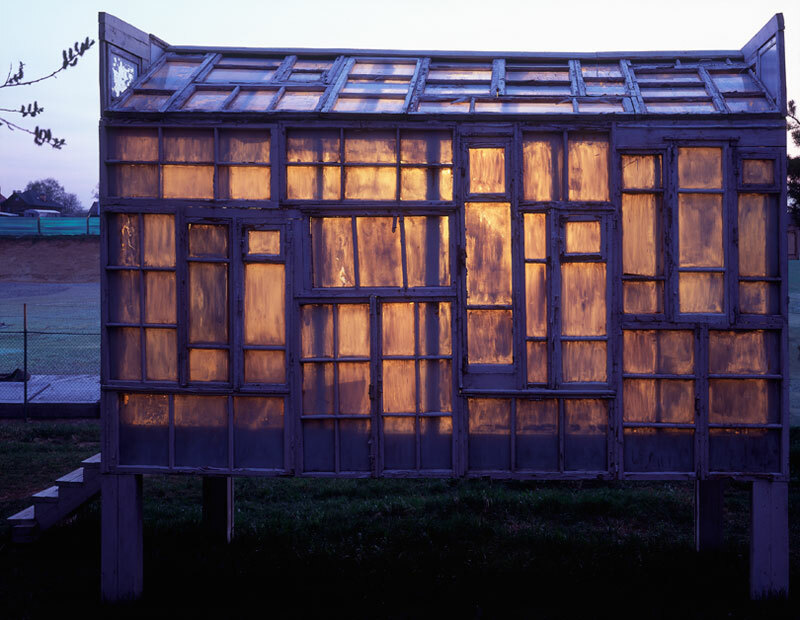 Suspended between primitive huts and worn dwellings, the works of Alexander Brodsky are shaped metaphors more than architectures. The traditions of Russian way of life, the characters and actions tied to a land so huge, yet so dispersed and isolated materialize in buildings which aim to exist only in idealized landscapes where ideologies or contingencies are forbid to enter and simple daily acts assume deeper spiritual meanings. The shores of Lake Klazminskoye are such an experimental area; not by chance several of Brodsky’s timeless and precarious cabins stand there, in a dialectical condition with time and nature, creation and threat. The rite of drinking vodka on frozen lakes may not appear as substantial as those who are traditionally linked to the celebration of death or god, but in a place built out of used materials, a newly invented ceremony constitutes a whole with architecture and memory. Two people shall step in, and stand at the two sides of the table. There’s a basin of vodka and two cups chained to the table. The visitors shall draw the vodka with the cups and drink it saying toasts in rounds. 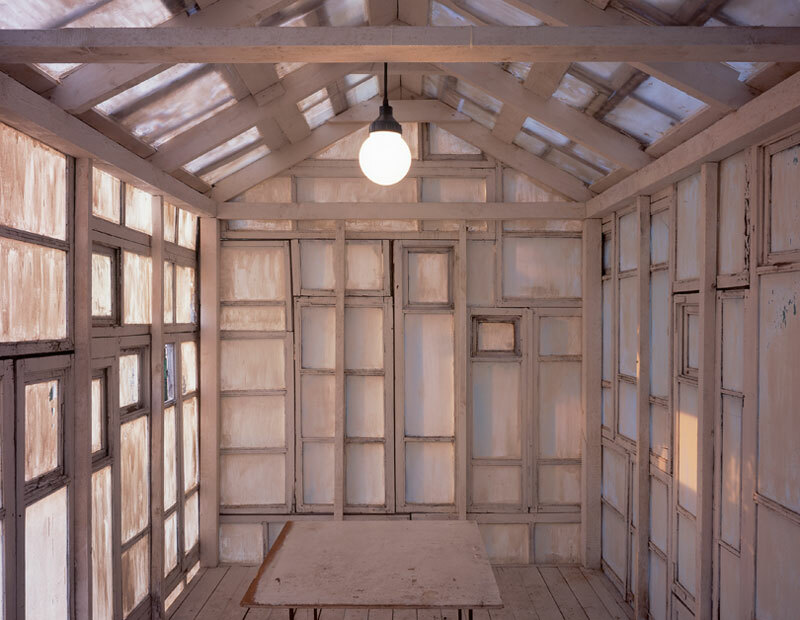 Old windows, doors and fences from demolished buildings are assembled and painted in white in Brodsky’s 2004 Vodka Ceremony Pavilion. Once in, outside and inside are clearly separated, glass’ transparencies interrupted, the floor raised off the ground: this refuge is a celebration of the persistence of tradition (although a “new” one) face at its unavoidable oblivion in time; ultimately evoking the timeless struggle between man and nature. Fight Club is not only a work of fiction. Chuck Palahniuk novel and the 1999 screen adaption by David Fincher show how man can voluntarily carve a dimension out of alienation, out of compromises, out of law. Face to an oppressive environment, frustrated, emasculated individuals’s last chance for freedom is identified in the Pasolinian analogy between human body and political identity, in the precise fact that we have not a body, but we rather are a body. Through the ritual of the infliction of pain man does not glorify violence per se, but he uses it in order to counter society-induced numbness through the experience of feeling. Against an analogous fraudulent idea of happiness, stands an unbuildable 2004 architectural project by Didier F. Faustino and the Bureau for Mesarchitecture, whose title and provocative aims come directly from the original fiction works, only to evolve them to a possible, further scenario. An architect longtime working at the edge of art, Faustino exhaustively makes use of the human body as a medium in social, political and physical dimensions, and exploring the complex relations that intervene between body and space. While the novel and the subsequent movie underpin the definition of a ritual of self-liberation where rules are set according to the users, Faustino’s Fight Club focuses on the necessity to establish a place of intervention, – in this way recalling the mythical foundation of a settlement, obtained through the division of a sacral, meaningful, territory. In fact, subverting the original concept of the Fight Club as secret spontaneous gathering of people reminding early Christian communities, Faustino chooses not to occupy urban areas traditionally bound to violence or generic law infringement (slums, skid rows, ghettos,…), but to install its work in open-air, highly symbolic squares, as Venice’s San Marco, or Beijing’s Tien An Men. 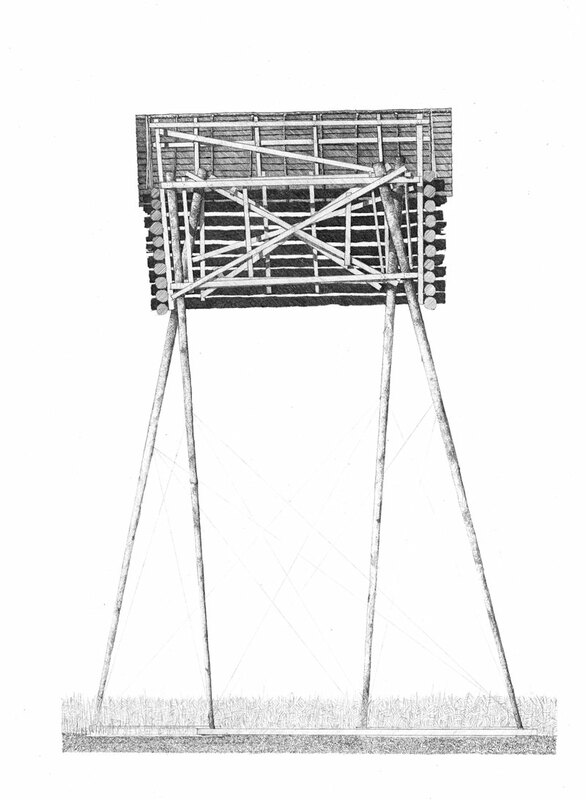 A modern-day arena defined by a wire mesh cage, seating and streetlamps, the installation is hence conceived as a micro space for a spontaneous and illegal ritual: enclosed from the rest of the city, it defines a territory of deregulation within the framework of either cities of mass tourism and the epicentres of ruthless display of power. But Faustino suggests a further implication, if we see in his work an evocation of modern society, where social life is being replaced by its representation and even an illegal activity can be contained in a controlled environment and publicly showed. Fight Club thus becomes a symbol of open surveillance and pervasive control, the violent downside of granting permanent security and apparent freedom in both Western Democracies and Far-Eastern Dictatorships. A pit, at the top of the tower of silence, in which the bones of the deceased were eventually placed. 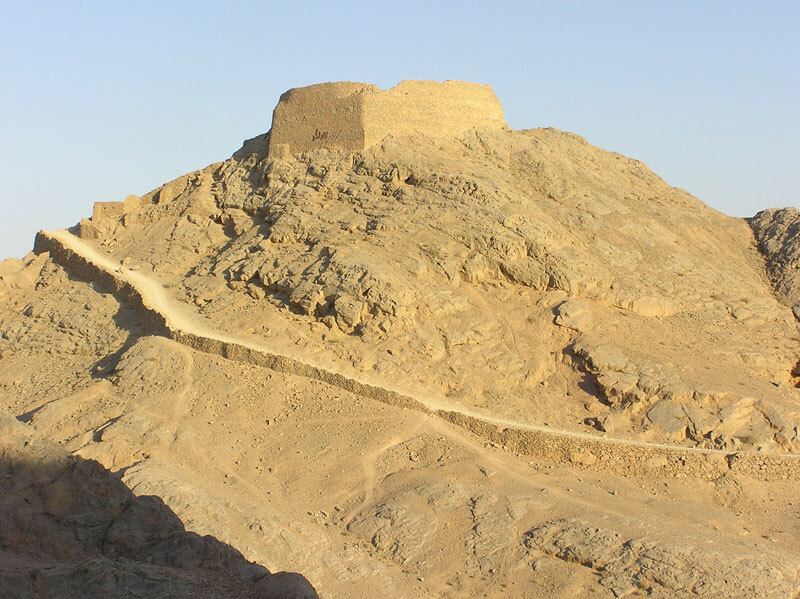 A Tower of Silence on the outskirts of Yazd, dating fromabout 1800. Zoroastrianism traditionally conceives death as a temporary triumph of evil over good: rushing into the body, the corpse demon contaminates everything it comes in contact with. The flesh of a dead body being so unclean it can pollute everything, a set of rules had to be created in order to dispose of the corpse as safely as possible: as the natural elements of earth, air and water are sacred, the corpses were not to be thrown upon the water or interred. Cremation was also forbidden, as fire is the direct -purest- emanation of the divinity. Hence a complex ritual was developed, in which the corpses would be eventually exposed to birds of prey and thus devoured, in a final act of charity. After death every division of class and wealth disappeared, for all deceased would be treated equally. 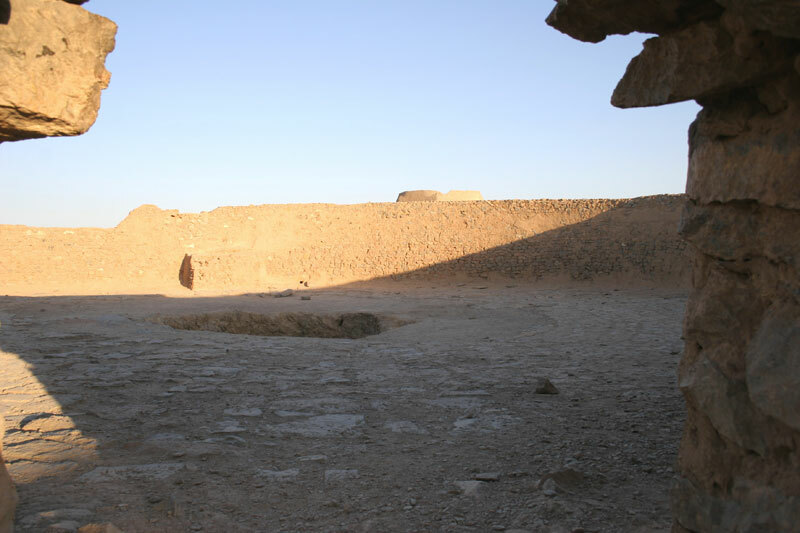 A proper architectural typology was invented solely for the purpose of burial’s ritual: transported in the desert by nasellars (traditional zoroastrian pallbearers), the bodies of the deceased were then carted onto sandstone, forbidding hills, to be eventually disposed on cilindrical constructions called Towers of Silence. A Tower of Silence, or Dakhmeh, is a structure laying on the top of a hill, consisting of concentric slabs surrounding a central pit. The bodies were arranged onto four concentric rings: men, outermost, than women and children. Despite the fact the the birds of prey needed less than an hour to leave nothing but bones, the remains of the dead were left bleaching on the upper circles no less than a year before the nasellars could come and push the skeletons onto the underlying ossuary pit. Running through sand and coal filters, the disintegrated bones were eventually washed away in the sea. A guardian traditionally lived near the Tower of Silence, and was the sole person allowed to handle the ceremonial procedures, while relatives of the deceased stayed in a house below, and were forbidden to enter. Iranian Zoroastrian discontinued this ceremony, and the Dakhmeh were banned in the 70′s; conversely, Parsi modern-day Zoroastrians in Mumbai and Karachi still mantains the tradition of burial by exposure, through the use of their own Towers of Silence. A commentary and denounce to the abandoning of Finnish countryside is materialized in the 1999 installation by Casagrande and Rintala “Land(e)scape” where some traditional barns, today unused, are mounted on wooden legs, as caught in the act of following their ancient owners toward the cities. The dramatic experience of the soil being now exploited for suburban sprawling is condensed in the frozen image of the escaping barns, which, having become useless and redundant, are today losing their traditional bound with the land. 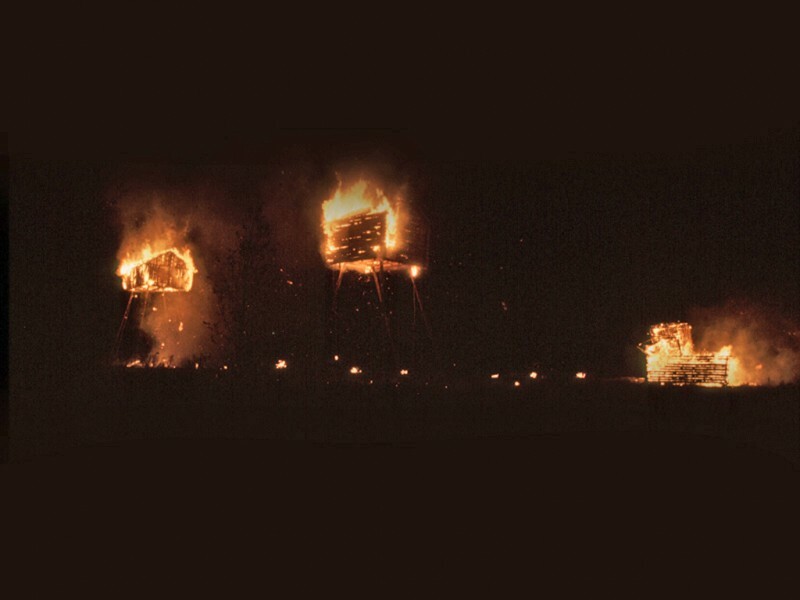 Through a “slaughter carnival” the barns are finally set on fire in the spring of 1999, the architecture itself is sacrificed, the building tore down as the animals they used to host were murdered in that time of the year. On a different, subtler level, the work itself is a ritual of passage in the career of the two young architects: struggling to find their own voice in a process where the clients and the politicians were always imposing themselves on the progress of their architecture, they decided to commit a “commercial suicide” abandoning the profession and making a work where themselves would be the clients, the architects and the builders. Free at last to express their thoughts through their work, the result came out in a delicate thought powerful process where architecture merged with memory, sense of place and community and finally evoked contemporary changes in society.